Wedding card with a request for vote for Aam Aadmi Party. 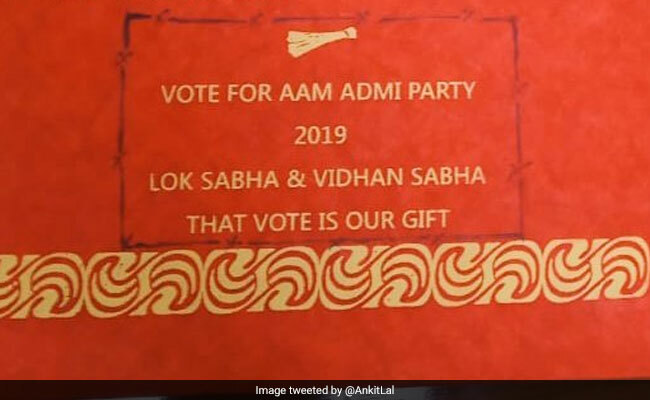 A couple from Haryana has asked for an unusual gift from their guests – their vote for Arvind Kejriwal-led Aam Aadmi Party (AAP). AAP’s social media strategist Ankit Lal shared a wedding invite of Jaswinder Singh and Inderjeet Kaur on micro-blogging site Twitter which has a special gift request. “Vote for Aam Aadmi Party 2019 – Lok Sabha and Vidhan Sabha. That vote is our gift,” the card reads. “This is almost everywhere in Haryana…,” Mr Kadyan wrote. The Prime Minister’s supporters, in the past, have used the Swachh Bharat logo on their wedding cards too. PM Modi had retweeted some of them.